A few weeks ago, we at Entek HVAC featured an award that we were honored to receive – formal recognition of a major retrofit to an aging university building in Portland, Oregon. The energy efficiency that our technicians achieved was nothing short of jaw-dropping, and we want to follow that celebration up with information about retrofitting that can save your business big money. There is no doubt that HVAC technology has evolved significantly over the course of many decades and, in fact, HVAC installed as recent as 8-12 years ago can likely benefit greatly from new technology. This is exactly what a retrofit is: installing new technology in an older system. Think of it this way: If your HVAC system was an older car that guzzled gas, replacing the old engine with a hybrid engine with the latest technological advances would dramatically increase efficiency and result in significant fuel savings for you. The new engine will have just as much muscle, if not more, but it likely won’t be as loud as the old engine, so if you like to impress others with loud, intimidating engine sounds, you may be out of luck. When replacing HVAC equipment, many are tempted to do an “in-kind” replacement, which means installing the same exact equipment it had before. While this may seem logical, equipment and parts that are many years old can be difficult to find, but the biggest detractor is that an in-kind does not have any of the advancements in technology and efficiency that lead to big energy savings. In an industrial space, stock, equipment, employees, and other physical objects are constantly on the move. An area where heating or cooling was needed last week may not be needed this week, yet with an outdated system, the temperature focuses will remain the same. One of the big accomplishments made by Entek’s technicians was to create great flexibility where heating and cooling is being directed, causing the efficiency numbers to skyrocket. In fact, a University of Virginia study found that an HVAC system that can monitor different areas of a space “has a 20.5% energy savings over the existing single-zoned thermostat” (Source pdf), and that is only one aspect of a newer system. When something needs maintenance, many people tend to focus on the one area that needs obvious help, for example an AC unit that is not cooling properly. Certainly business managers want to keep costs down, but by narrowing their focus to one current problem, they may be losing out on an opportunity to overhaul the entire system. Addressing one problem at a time almost guarantees that the next problem with the older system is right around the corner. The truth is, the sooner a system is brought up to speed as a whole, the sooner the business will likely see energy bills decrease significantly. A business’s employees are the wonderful assets when it comes to HVAC retrofitting. They know where problems are in the system, which areas of the industrial space get too hot or cold, and where energy is being wasted, but unless they are asked to be involved in the process, this knowledge is lost. In addition, when employees, management, and HVAC technicians work together, everyone will know what the system will do, how it operates, and how to control it. As the people spending the most time in the space, it is a huge benefit to have the employees’ ears on the ground when it comes to HVAC functioning. It also helps to have employees on board in the process when people and equipment will have to move temporarily to allow for the retrofitting in different areas, and they will likely not resent the temporary changes. Entek HVAC has worked wonders for other industrial spaces and can do it for you. 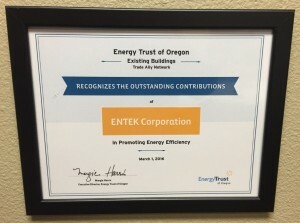 Entek has trusted HVAC efficiency experts serving Southwest Washington and the Portland area.